Is it possible to find any genetic origin for Jews? Could it be a nation, ethnicity or a religion? Are the Jews only members of a political association; which was pagan then called Judaism and later Zionism? Surely there is no point in seeking origins or common features for Jews because they are not biological. They came from one specific ethnic group but soon they turned into a composition of people with different origins, languages and features. Like other businesses or politics Jewry have no Semite origin, common features, language, religion, race, or genetics. The story of Jews began by Turkic Mongolian groups in eastern Mongolia in 1800 BC. They discovered the power of horses and metal weapons and used them to raid, enslave, loot, and colonized the Scythian. They stole Scythian identity and wealth and from there they branched into three directions. First, to eastern Aryan land and north India. Second, to Mesopotamia, Levant, and Asia Minor. The third direction was to Pontic–Caspian steppe and Eastern Europe. Turkic Mongolian various groups had many names and different leaderships. They didn’t use or know the term Jews until 530 BC after they decided to kick out their former partners, Hebrew Israelite, from Canaan. This displacement and colonization of Canaan were done by replacing few hundreds of Israelite rulers by many hundreds of thousands of Turkic settlers coming from Persia. It was done by the alleged Babylonian Exile and after 50 years by the Babylonian Return. 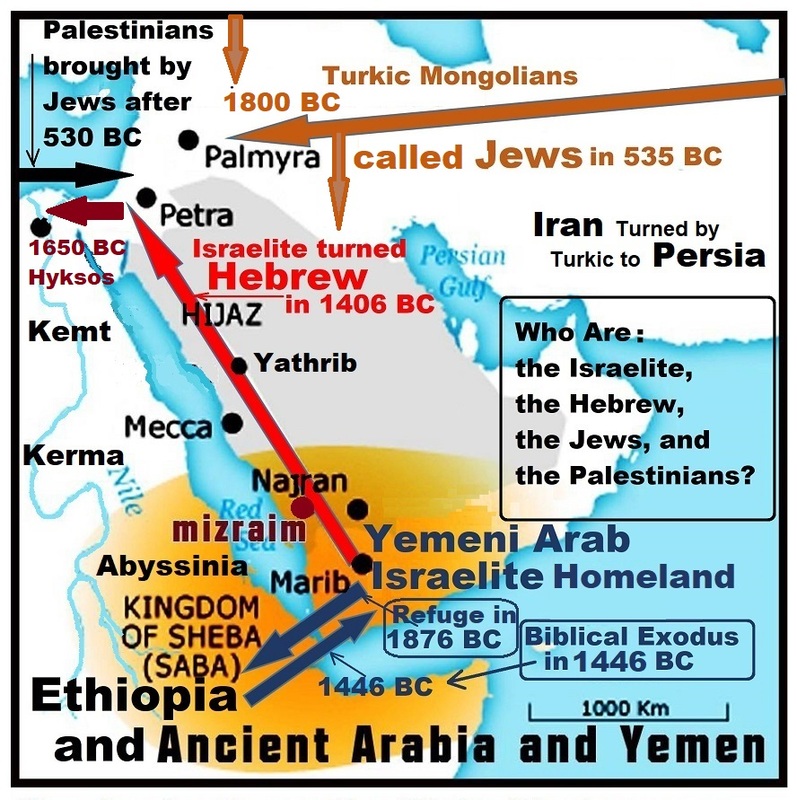 The Israelite were Arab Semite tribe from Yemen who took refuge in Abyssinia (Habasha) and Kerma (ancient Ethiopia and ancient Nubia) from 1876 to 1446 BC. During that period they established collaboration and various illicit businesses with the Turkic Hyksos who colonized north Egypt. The Hyksos were defeated and expelled by Ahmose I in 1523 BC. He also expelled the Israelite from Kerma in Nubian Sudan. The Israelite never went to Egypt as the Hebrew Bible later stated. Due to their atrocities the pagan Israelite were expelled from Abyssinia but they fled under the leadership of Moses to take with them their banned unlawful loot. In Yemen the Israelite received the Ten Commandments and the Torah from EL which were in the Ge’ez language of Abyssinia. After the death of Moses the leaders of the Israelites under the command of Aaron decided to abandon and forge the scriptures. They chose to migrate from their homeland of north-west Yemen and Asir to invade and colonized Canaan. They joined forces with the expelled Turkic Hyksos and groups roaming in north Arabia. The word JEW originated from YHWH which had uncertain origin. The first mention of YHWH is found in ancient Egypt (Kmt) as Shasu of YHWH (nomad of Yahweh), which was used to identify the foreign raiding nomads from Asia. These Shasu of YHWH looted Mesopotamia and the Levant for 150 years before they infiltrated into northern Egypt around 1650 BC. In 1630 BC they took up arms and colonized north Egypt creating the Hyksos (1630 – 1523 BC) and YHWH deity. The term Hyksos came from Heka-chasut which meant for the Egyptians nomadic rulers. The Jews went into four distinct periods. Pre-Jewry (1800 – 530 BC) they enslaved Eastern Europeans and Iranians. Earlier Jewry: (530 BC – 720 AD) were Turkic mixed with their Asian and Middle Eastern slaves. Intermediate Jewry: (720 AD – 1700 AD) They were mixed with slaves from Eastern Europe, Caucasus Anatolia, Balkan, North Africa, defunct Roman Empire, and Iberia. Together with their Ottoman branch they organized the colonization of the Americas, African Trans-Atlantic slavery and colonization of Africa. Modern Jewry: (1700 AD – Now). They are heavily mixed with their European. They settled in all parts of the world. The Zionist movement was established practical in 1881. They organized to take Canaan back from their Palestinian slaves claiming they are the heirs of Earlier Jews.